These works not only include three new stations – Marymede, Hawstowe and Mernda, but also includes a larger general development process for the town of Mernda itself. The outer Northern suburbs population growth is continuing to increase rapidly, with population for Mernda almost doubling in 5 years (from 2011 – 2016). This means that the completed upgrades will be used not only by the existing population, but will give the outer North more unique features, and encourage young families who are looking for cheaper places to live than the city a viable option. Complete standalone houses are also substantially cheaper to buy in these areas as well, as city development and apartment price skyrockets in comparison. A town centre with a shopping strip, parking and cycle routes are also being touted along with the rail project. This will give Mernda the complete package, rail, schools and shops. The proposed new Marymede station is also located directly opposite Marymede Catholic College – giving students a safe and easy way to get to and from school. The sleek modern design of these stations will push the Northern suburbs into the future. Along with the high functionality, more frequent trains, abundant parking (up to 2000 spaces at Mernda station) and spaces for cafes and retail are included. The power of the people has proven to be a success in this case, as local community program Access Denied pushed hard for new rail and road upgrades. The beginning of construction of these projects is a big win not only for commuters but also for campaigners who have been working so hard for it. It was 1930 when the last train line was extended by more than two stations (Glen Waverley), and considering the South Morang station itself was only opened in 2012 (previously ending at Epping), it shows that the popularity of the Northern corridor continues to increase. 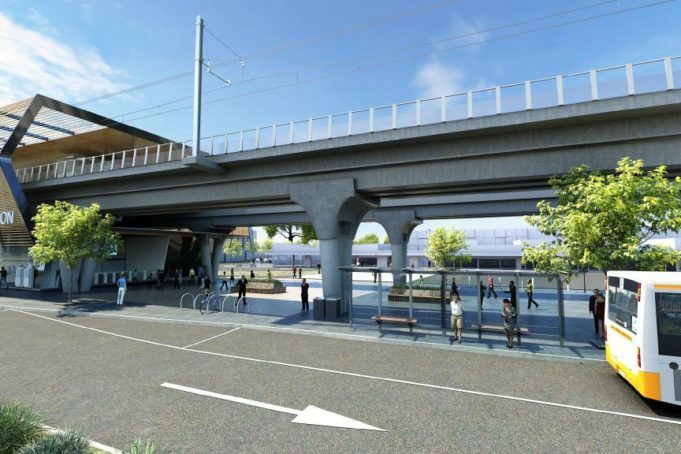 Rail duplications will be included in the South Morang railway line extension, so that the current problems being experienced across the network by non-duplicated lines (such as the Rosanna – Heidelberg part of the Hurstbridge line) will be easily avoided in future. These upgrades will create up to 3000 jobs not only in construction directly related to the works but also in businesses adjacent to the new rail extensions. Picture is an artists impression of the proposed Mernda station and its surroundings.